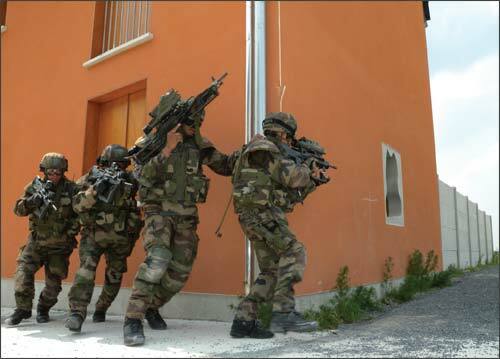 The year 2009 was a crucial year for France’s FELIN (Fantassin à Equipements et Liaisons Intégré) integrated soldier programme. Between February and July 2009 the French Army and France’s defense procurement agency (DGA) completed final and intensive field tests as part of FELIN’s technical-operational evaluation (EVTO). For the final weeks of the EVTO, 135 FELIN soldiers from the 2nd Armored Brigade’s Marche du Tchad Regiment (RMT) and an SGTIA Interservice Tactical Subgroup – reinforced by soldiers from the 8th Marines’ Infantry Paratrooper Regiment – were used to illustrate the new system’s contribution to urban warfare. An entire section of forty FELIN-equipped RMT soldiers from the EVTO campaign were present on July 1 at the urban warfare training center (CENZUB) to demonstrate the capabilities of the French infantry’s new system. With support from a VAB armoured vehicle, the FELIN section carried out an exercise consisting of taking out a target with force and putting down a counter attack. The theatre chosen for the Exercise was Jeoffrécourt, an artificial town built by the French Army about 150 km northwest of Paris and close to the small town of Sissonne. A component of the CENZUB, Jeoffrécourt was designed to provide realistic training for soldiers, presenting them with all types of urban settings: large buildings, residential neighborhoods with small houses, boulevards, small streets, industrial areas, etc. The town is in a vast space used for manoeuvres, which means troops can be trained successively in open terrain and urban areas during the same exercise. Opened in 2008, the CENZUB was designed for training scenarios similar to those encountered in real-life operations, making it an ideal setting to carry out the FELIN system’s EVTO. As the last stage of the FELIN programme before delivery of series equipment, the EVTO allowed the Army’s units to test the system from February to July 2009 with all its weapons and in all configurations in the harshest of environments (the hottest, coldest and most damp). The campaign took place in mountainous terrain, in the jungles of French Guiana and the deserts of Djibouti, where the Army tested out its NBC equipment. Daytime and nighttime tactical firing was carried out at Camp Larzac. Finally, in June, FELIN was brought to the CENZUB at Sissone to test the system in urban warfare. The tests represent a success for the French military actors involved in FELIN (ie, the DGA, the French Army and Sagem, the prime contractor). As such, FELIN is the result of a political will to enhance France’s infantry. It is the fruit of constant effort aimed at creating an integrated system of new technologies (ie, information and communication technologies, optronics and GPS) to enhance the efficiency and survivability of soldiers in combat. The initial studies were carried out as part of the ECAD survey, launched in 1993 by the DGA and involving French defense contractors. The results allowed specifications to be drawn up in 2000. As a result, substantial design work forms the basis for FELIN, namely concerning the system’s ergonomics. All of which contributed to the relevance and credibility of the FELIN system as it appears today. In March 2004, the programme entered the industrial phase: following a call to tender, Sagem (Safran Group) was awarded the contract for the FELIN system by the Ministry of Defence. To date, three of the French Army’s units have tested FELIN as part of the EVTO: the 13th Battalion of Chasseurs Alpins, the Marche du Tchad Regiment and the 8th Regiment of Marines Infantry Paratroopers. In addition, legionnaires from the 2nd REI were also able to test the future info-centric combat system during the two-week Phoenix demo in October 2008. The continuity between the transport and support vehicles’ means of command, the infantry VAB armored vehicle and the SitComdé (terminal information system for the dismounted soldier) C2 equipment for the section leader. The EVTO results are therefore in line with the French military’s expectations. FELIN’s new features are centered around the soldier’s needs: protection, weapons use, communication and intelligence, positioning, navigation, awareness of the positions of friends and foes and stamina. Consequently, FELIN integrates a whole range of technological innovations that provide the soldier with enhanced efficiency and protection. This includes the around-the-corner sighting system, a new radio with a GPS to communicate in confined spaces or in open terrain, sights with uncooled infrared providing soldiers with night time combat capability through their weapons and new protective material. With respect to optronic systems, sights or JIM imagers, they can be used to transmit images to upper echelons of the command. Sagem has also worked extensively with the military and the DGA to provide FELIN with sophisticated ergonomics well suited to combat needs. This ease of use can also be found in the C2 systems, whether they’re system components or associated ones such as the SITEL Battle Management System. An example would be the control panel on the FAMAS rifle, which allows the soldier to use the radio and sight, and activate around-the-corner sighting while keeping both hands on the weapon. The FELIN-equipped soldier is also capable of operating collective weapons, namely the Eryx anti-tank missiles launchers, used during the EVTO. The success of the EVTO was therefore crucial and consolidated FELIN as the most complete and advanced dismounted soldier integrated system in Europe. As the DGA put it: “The 1st regiment will be equipped in the 1st trimester of 2010, with overseas deployments possible at the end of 2010”. There will be four regiments delivered per year. FELIN is set to change combat methods once it is delivered and each soldier receives the adequate training in order to use the system to its full potential. On their way back from French Guiana, French soldiers expressed their satisfaction: “I prefer having FELIN in my hands rather than the enemies.” FELIN is now within a few months of entering into operational service in the French Army.